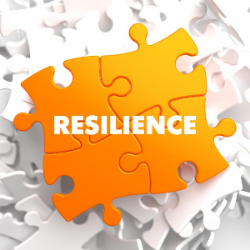 Resilience gets a lot of press in the immediate aftermath of a major disaster, like a flood, or major economic event such as the financial downturn of 2008. However, once the waters of disaster recede, such terms may be forgotten. Does resilience still matter? When you say resilience, are you talking about merely surviving or all-out thriving? The truth is, there is no such thing as a “stable” job anymore. It is likely you will have to conduct another job search. The trick is how gracefully and readily you face that change. How can you boost your career resilience? Resilience is a trait that can be learned and cultivated. One thing you can do is change the ratio of your positive to negative self-talk. According to TalentSmart (experts on emotional intelligence) 90% of top performers are skilled at managing their emotions under stress. These individuals remain optimistic during difficult times and believe in their own ability to overcome challenges and unpredictable changes. For you, that means managing rejection and disappointment by focusing on the things you have done right. It means that instead of judging yourself harshly when you don’t do your best in an interview, you learn to focus on the parts of the interview that you handled well. Further, it means that you take steps to handle the challenging questions more effectively next time by rehearsing your answers with a trusted colleague. Identify tools that help you manage your emotions under stress such as exercise, prayer/meditation, spending time with family, etc. Finally, recognize that asking for help is not a weakness. Rather, think of asking for help as an accelerator that can speed your job search and boost your ability to achieve your career strategy sooner.